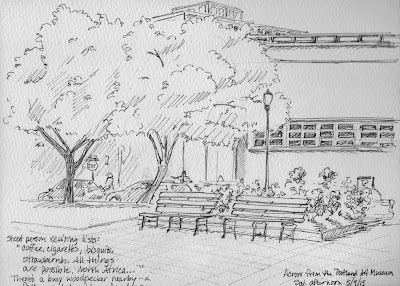 I've been taking a Sketchbook Skool (yes, it's spelled that way) class and last week's instructor was Urban Sketcher, Miguel Herranz. 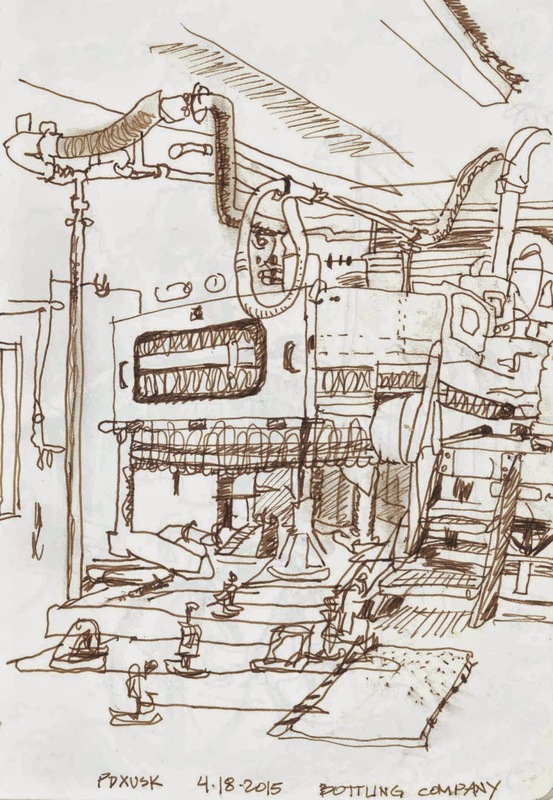 One of his suggestions was to start a drawing in the center and then spiral out from that instead of doing a layout first. 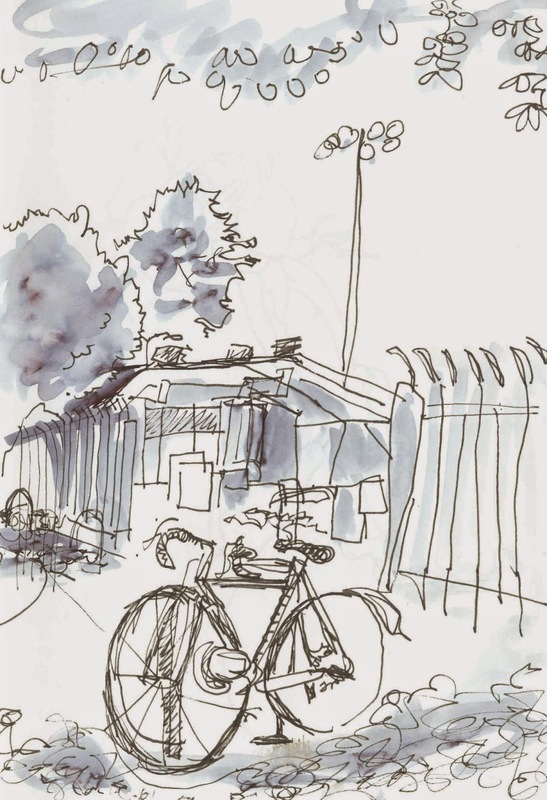 One advantage to this kind of sketching is that you can stop at almost any time and you have a fairly complete looking sketch. 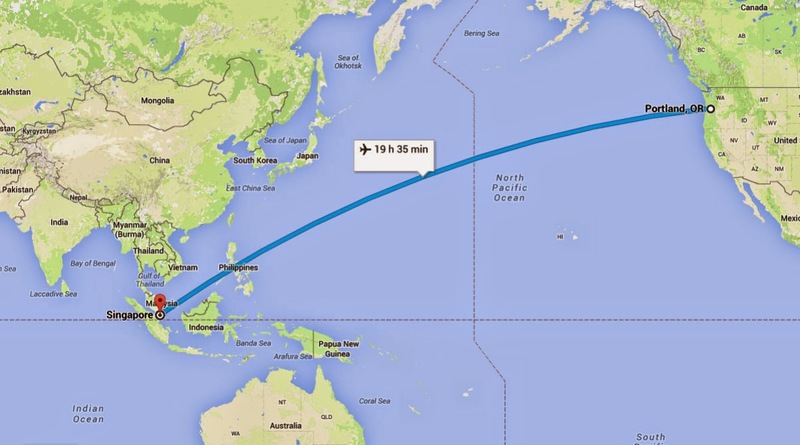 Somehow, I haven't found it very easy to stop, though. 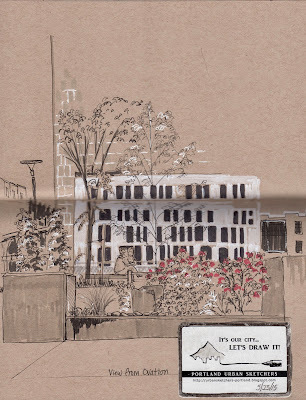 I started the Jamison Square sketch yesterday and went back to finish it today. 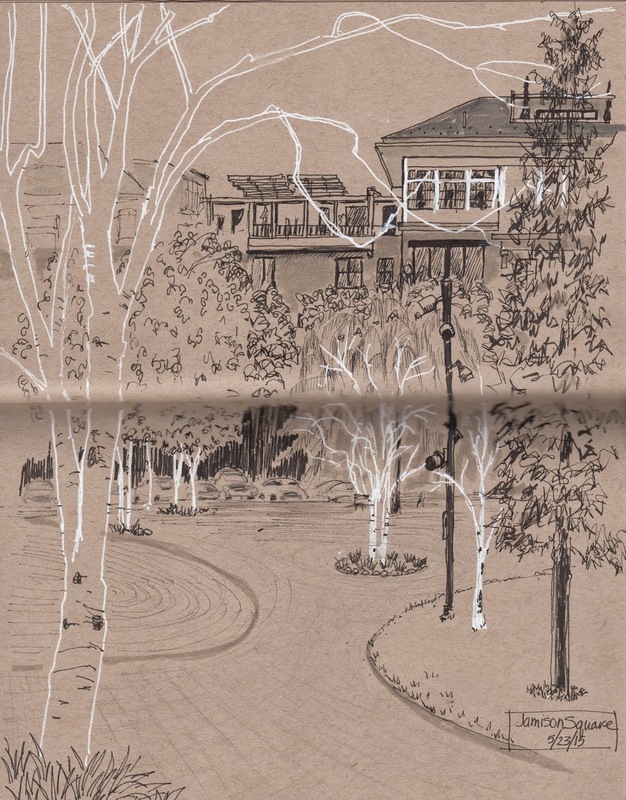 I had drawn the birch trees with white gel pen and they looked like ghost trees. Today, Deb informed me that they are infected with Birch Boar and are indeed dying. That's too bad. 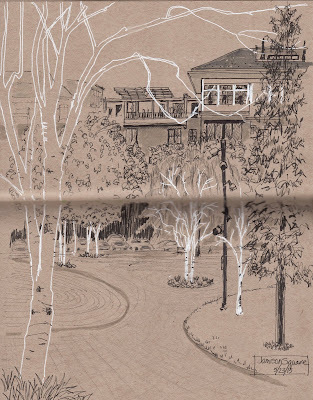 I've been drawing these trees over several years and it will be sad to see them go. 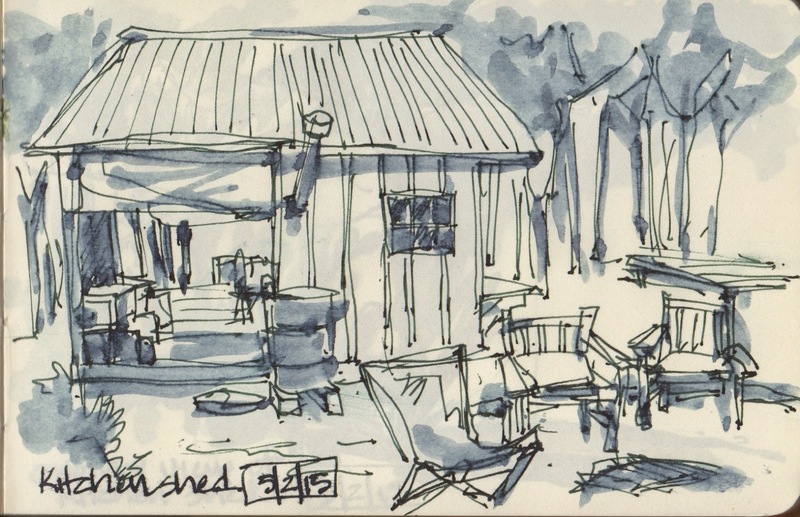 This next sketch was drawn from inside at the always welcoming Ovation Coffee Shop, bordering the Fields. 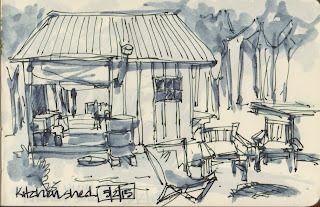 A few of us sketched inside, waiting for the drizzle to end. 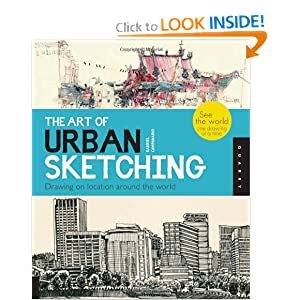 Again, Deb helped me out by giving me an Urban Sketcher sticker to cover up the partially drawn dog that I didn't have time to finish before it walked away. 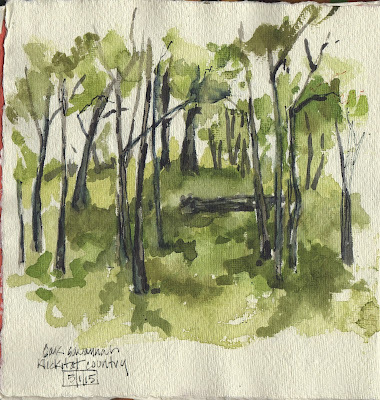 The toned paper seemed appropriate for the cloudy days we had today and yesterday, but here's a bit of color from a sunnier day last weekend. 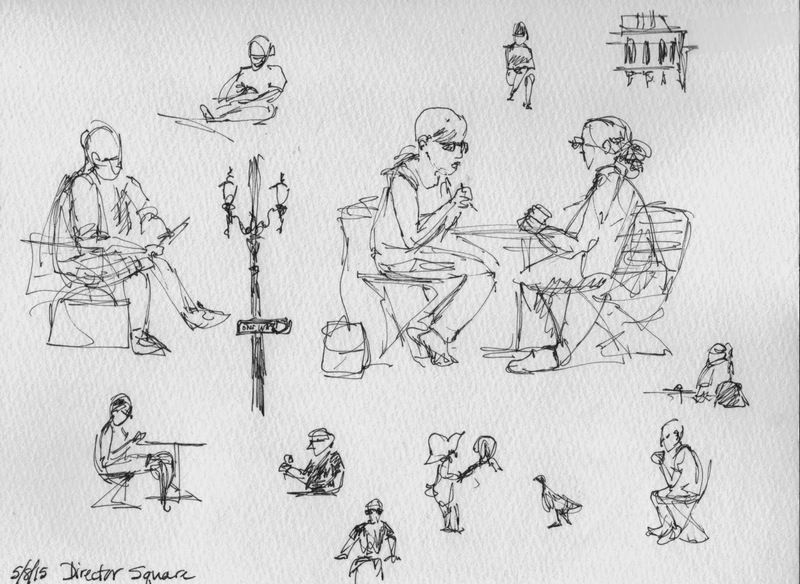 These are my sketches from the April sketch crawl. What a lovely spring day that was! There's a relatively new food cart pod in SE Portland: Tidbit. 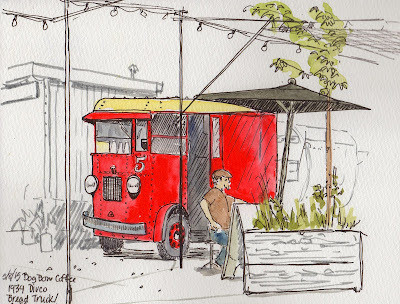 Besides having good food and seating, there are some very charming carts, nice plants, and friendly vendors. 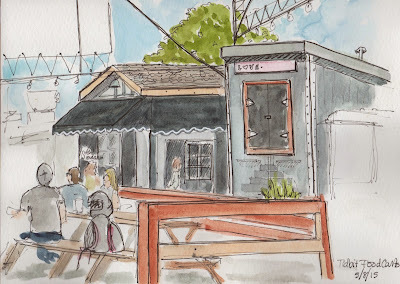 Here's a sketch of Dog Bone Coffee and John, the vendor. Unfortunately, the dog, Talon was out of my view. 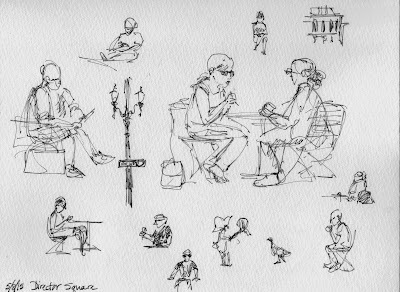 This is a sketch from the park blocks in front of the Portland Art Museum and some quick sketches from Directors Square. 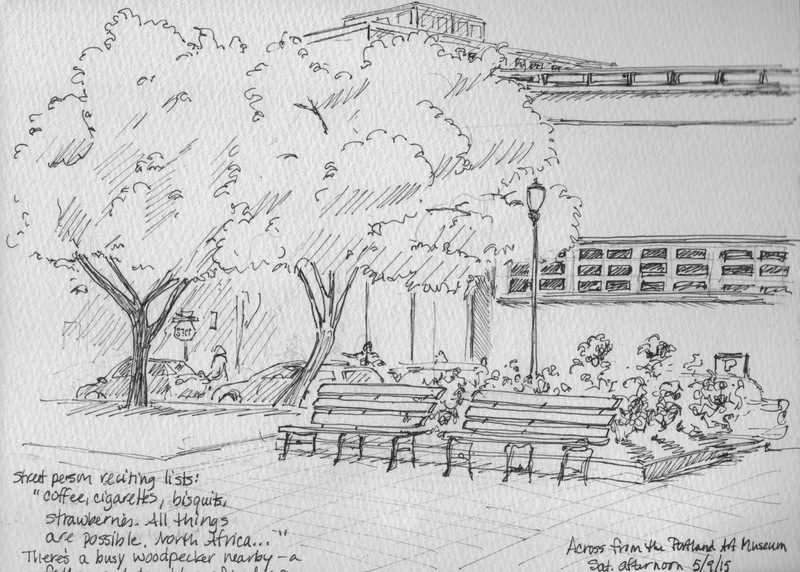 Lots of people were out enjoying the sunny day yesterday, but they never stayed for long on the benches I was drawing. 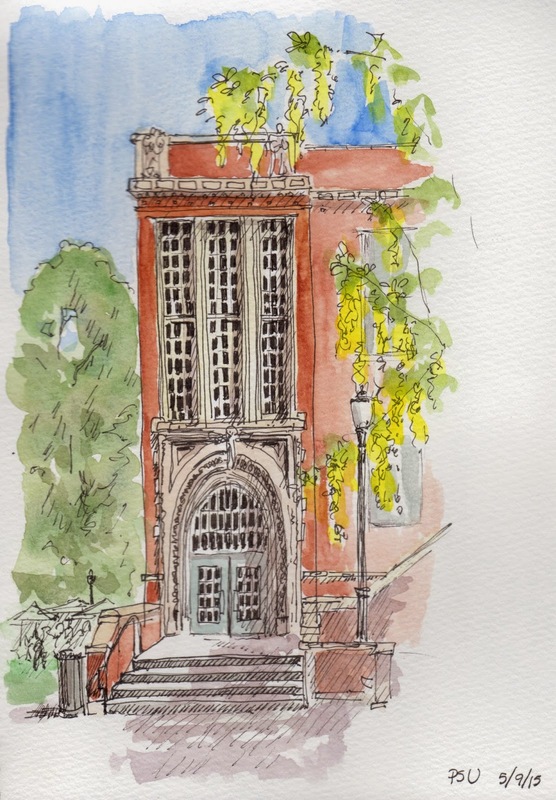 Saturday, May 30, please join us for a sketch crawl, lunch potluck, and sketch materials exchange. Bring your art materials that you don't like to use and get some different stuff. This is in the Sunnyside neighborhood, between Belmont and Hawthorne. 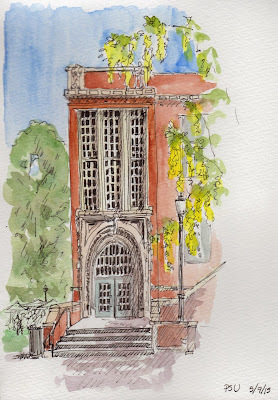 10:00am: Introductions and snacking, drop off potluck food and sketch materials for the exchange. There will be coffee. 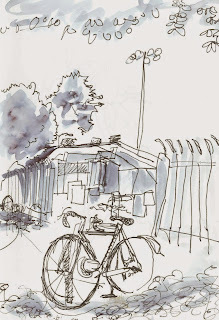 10:30am: Sketch crawl around Sunnyside neighborhood. 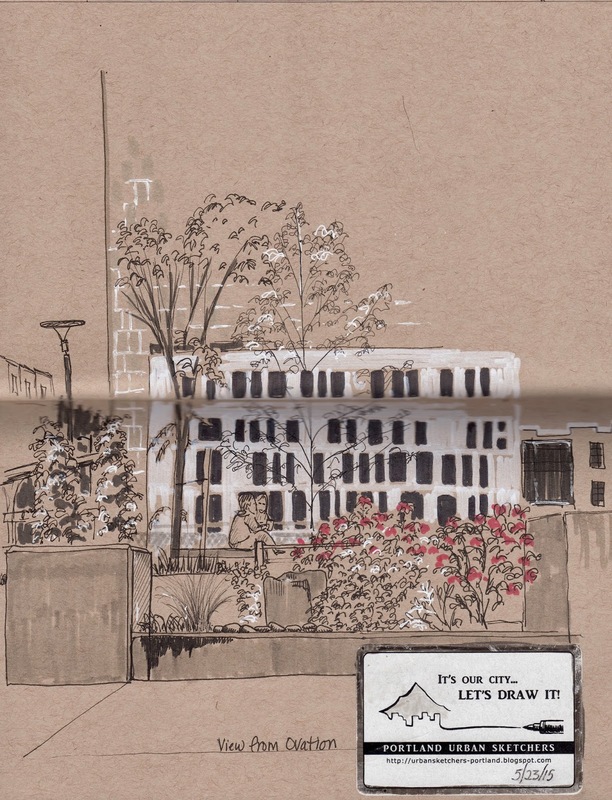 12:00noon: Sketch materials exchange - swap your languishing art materials for something new to you. 12:15pm: Sketchbook sharing and lunch potluck. This past weekend I (along with several other landscape designers) traveled east of the Cascades to a camp belonging to a fellow designer to camp overnight, hike and view the wildflowers. This was not camping in a sense of being deprived in any way. 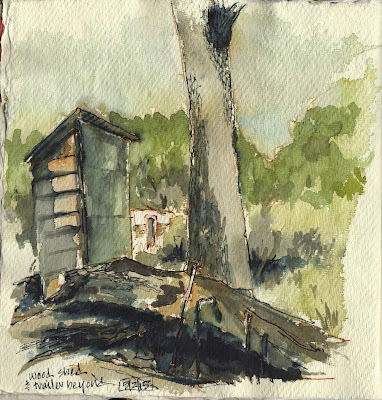 I slept in a small trailer and the only nod to 'camping' was the outhouse. 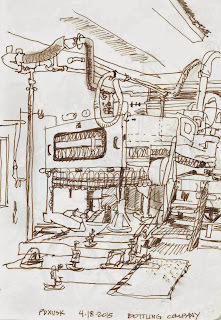 Here are some of the sketches I did there. 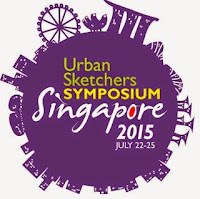 Registration is still open for the International Urban Sketchers Symposium in Singapore, July 22-25. For more information about the Symposium including schedule and registration information, please visit http://singapore2015.urbansketchers.org/.